Despite his humble origins, Senenmut rose through the ranks of the court to become Queen Hatshepsut’s closest advisor, and tutor to her daughter Neferure. It was rumoured that he owed his privileged position to intimate relations with the queen. Whatever the truth of the matter, Senenmut was not only Chief Architect and Overseer of Works, but was also Chief Steward of Amun, Steward of the barque ‘Amen-userhet’, Overseer of the Granaries of Amun, of the Fields of Amun, of the Cattle of Amun, of the Gardens of Amun, and of the Weavers of Amun. He was unrivalled in the administration of the country, and only the Chief Priest of Amun, Hapuseneb (also vizier and architect of Hatshepsut’s tomb) could match him in religious affairs. 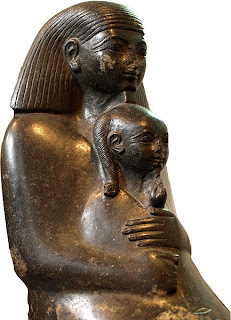 Seated Senenmut holding the princess Neferure in his arms, on display at the British Museum. Senenmut built two tombs for himself, one, of the normal T-shaped plan of the New Kingdom, was amongst those of the other nobles in Sheik 'Abd el-Qurna (no. 71), but his other one was much more presumptuous. The entrance to it was cut in a quarry to the north of the approach road to the Deir el-Bahari temple and just outside its temenos. This had a deep entrance stair heading north-north-west so that the chamber was located under the outer court of the temple. A sketch of Senenmut appears on the northern wall of the stairway entrance, but he had also represented himself kneeling and worshipping in a relief concealed behind the opened doors of the small shrines in the upper sanctuary of Queen Hatshepsut’s temple.